Reducing greenhouse gas emissions is not simply a case of switching cars to electric power – at least until the whole world runs on renewable energy. Mazda’s ‘well-to-wheel’ approach to reducing emissions considers fuel extraction, manufacturing and shipping as well as driving. One part of this bold plan is SKYACTIV-X. This revolutionary engine, a world first, employs a method of combustion – compression ignition – that the combined might of the motor industry has been trying to master for over two decades. This technology considers real-world emissions over a car’s entire life cycle. Of course, Mazda plans to introduce electric vehicles to areas that have clean energy sources and will add hybrid and plug-in vehicles, but the internal combustion engine will continue to be the base power unit for 85 percent of all cars up until 2035. That’s why SKYACTIV-X is such an important breakthrough in Mazda’s goal to reduce ‘well-to-wheel’ carbon dioxide emissions to 50 percent of 2010 levels by 2030, and a staggering 90 percent reduction by 2050. To explain how SKYACTIV-X works, we’ll first need to cover some engine basics. In a gasoline engine the fuel-air mixture is ignited by a spark from the spark plug. In a diesel engine, the fuel-air mix is compressed and ignites through pressure and heat alone. Diesel is more energy dense than gasoline, which also means more air and less fuel goes in, making for better fuel economy. And although diesel engines tend to release less carbon dioxide than gasoline engines, they traditionally emit higher levels of particulates that can cause pollution. Diesels, which are often turbocharged, have a reputation for having lots of torque even at low revs, while gasoline engines can rev higher and produce more horsepower at those high revs. SKYACTIV-X offers the best of both diesel and gasoline engines with none of the disadvantages. It does this thanks to a new technology called Spark Controlled Compression Ignition (SPCCI). Running on regular gasoline, SPCCI works by compressing the fuel-air mix at a much higher compression ratio, with a very lean mix. 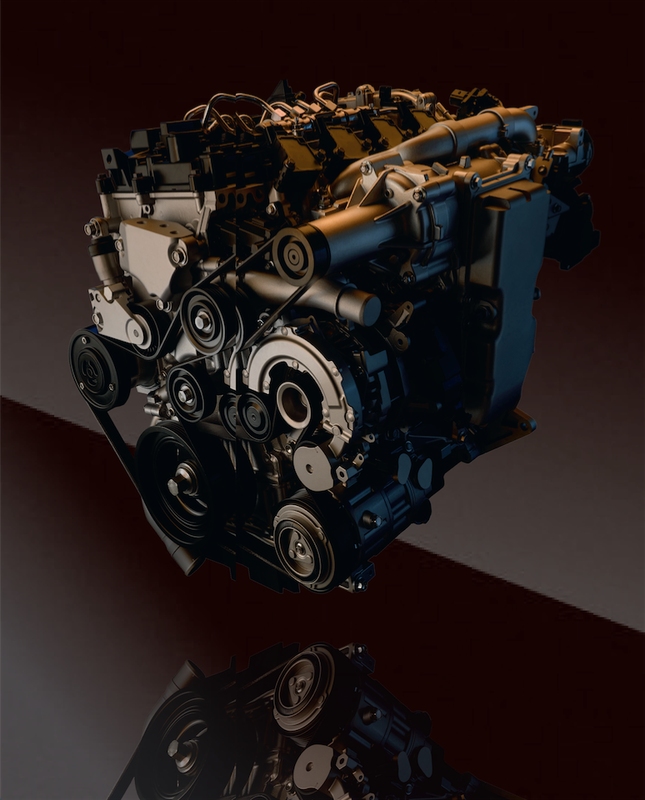 The SKYACTIV-X engine uses a spark to ignite only a small, dense amount of the fuel-air mix in the cylinder. This raises the temperature and pressure so that the remaining fuel-air mix ignites under pressure (like a diesel), burning faster and more completely than in conventional engines. The result? Ten to 30 percent more torque than the current SKYACTIV-G gasoline engine with better fuel efficiency than the current SKYACTIV-D, and a power increase of ten percent. This best-of-both-worlds achievement was made possible by Mazda’s relentless pursuit of perfection. Engineers analysed every detail from the piston shape to the swirl pattern of the fuel-air mix. As is the Mazda way, it’s those tiny details that make a huge difference. The two-litre SKYACTIV-X will produce more power, with up to 30 percent more torque than the current SKYACTIV-G 2.0. SKYACTIV-X improves fuel efficiency up to 20-30 percent over Mazda’s current gasoline engine. And, importantly, it has been designed for real-world efficiency, not simply to do well in a government test cycle. Whether mated to a six-speed manual or six-speed automatic transmission, the SKYACTIV-X engine delivers an instant response when you put your foot down. It pulls like a turbodiesel, but revs like a normally aspirated gasoline engine. Unlike an EV or other alternative powered car, there’s no need to ‘relearn’ driving or suffer from range anxiety. SKYACTIV-X runs on regular gasoline and drives just like you’d expect your Mazda to drive. SKYACTIV-X has been designed to work alongside electrification. It can work as a standalone power unit or in hybrid and plug-in hybrid vehicles.